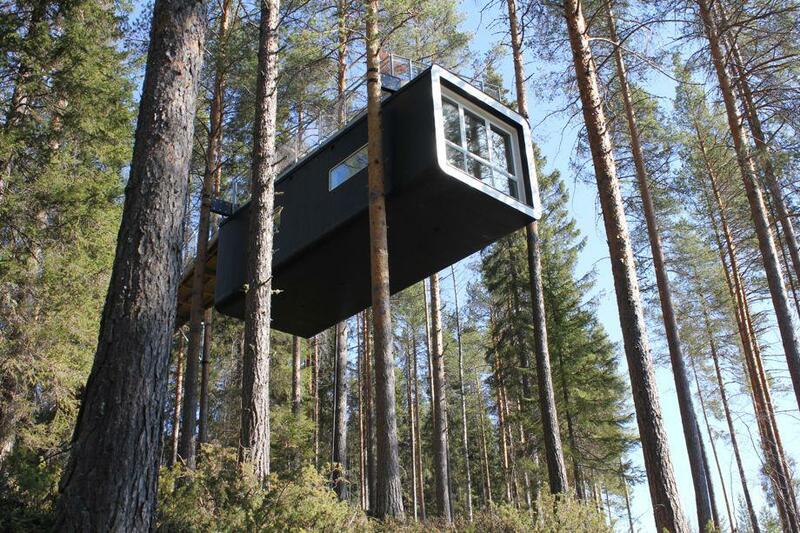 Treehotel: A grown-up childhood escape fantasy in the Swedish woods. 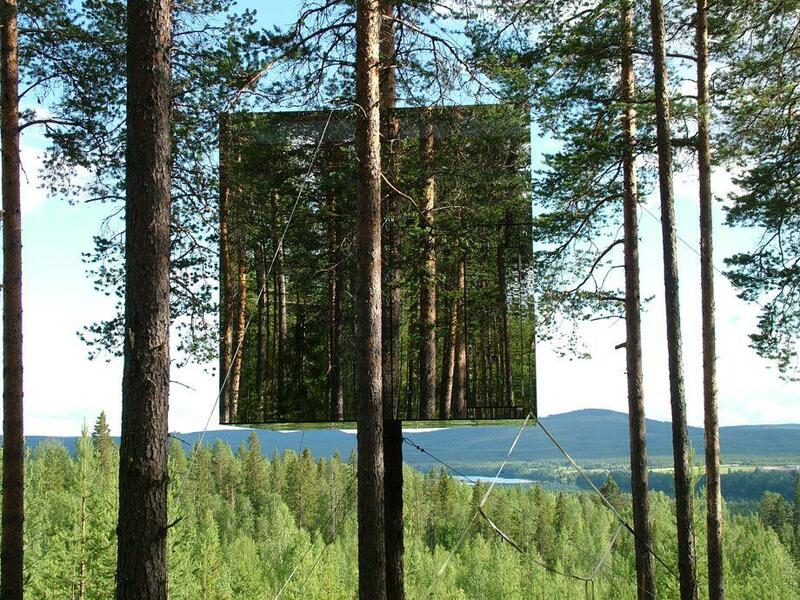 The Mirrorcube is one of the “treerooms” at the Treehotel in Sweden. ’Tis the season when many dream of avoiding the tyranny of holiday obligations and escaping to a remote fantasy location. Some pine for deserted beaches. But one look at photos of the magical Treehotel in Harads in the north of Sweden and I know where I am going (in my head). The treehouse hotel has become its own genre in recent years, but the Treehotel is an unusually sophisticated expression of every child’s fantasy. What’s more, each of its half dozen self-contained “treerooms” is a uniquely designed structure, both inside and out, all singular and ambitious iterations of the aesthetic possibilities of a treehouse. 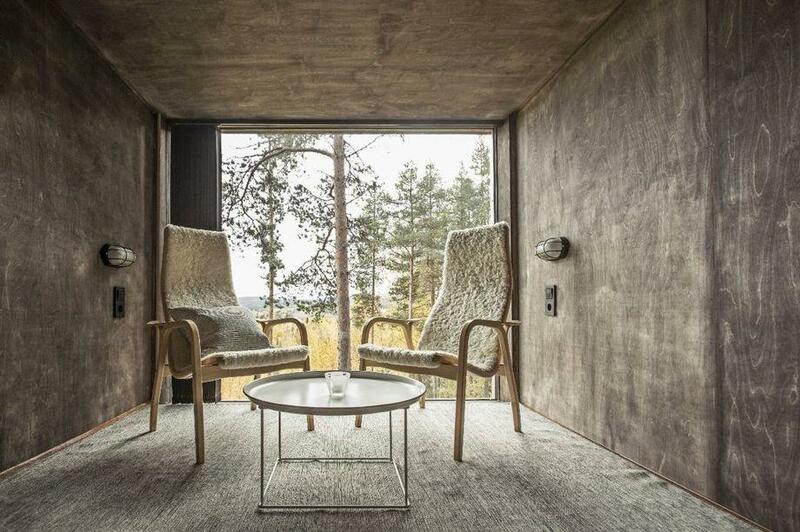 The sleek Mirrorcube (above) from Tham & Videgård architects reflects the surrounding forest, lending it a sophisticated camouflage effect in the right light. Built on an aluminum frame, its glass walls have been clad in an infrared film whose color is invisible to humans but highly visible to birds to prevent them flying into the exterior. The Mirrorcube’s mirror opposite is the Bird’s Nest by Inredningsgruppen and Bertil Harström, a structure that looks quite simply like a giant version of its namesake. Guests enter via a retractable stairway. Another structure, a red treehouse incongruously named the Blue Cone and designed by Sandell Sandberg, is made from laminated birchwood and is wheelchair accessible via an entry ramp. 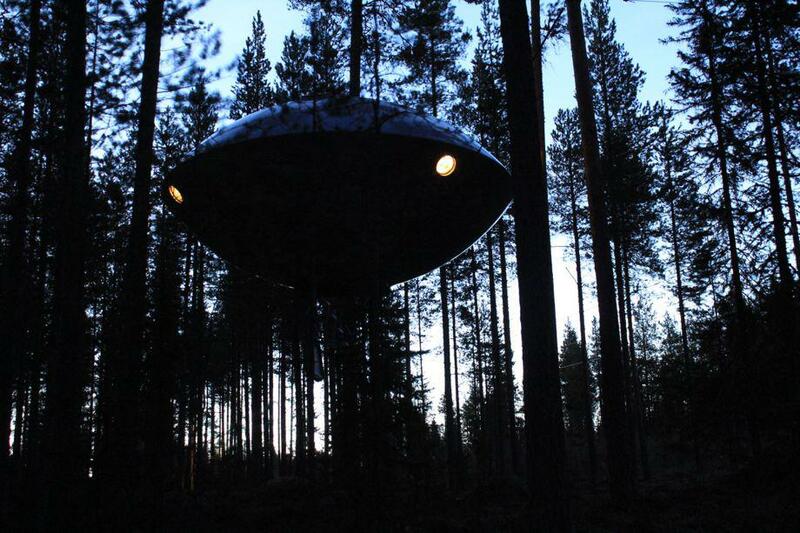 A treehouse shaped like a huge UFO by Inredningsgruppen and Bertil Harström sleeps four. The Treehotel is the brainchild of Britta, a former nurse, and Kent, a teacher turned international fly fishing travel guide, who run a conventional hostel nearby. The idea of building a little village of treehouses in the middle of the Swedish woods was inspired by Swedish director Jonas Selberg Augustsén’s 2008 documentary The Tree Lover, about three men who build a treehouse as a means to connect with their rural childhoods and end up ruminating on the philosophical nature of the relationship between man and tree. 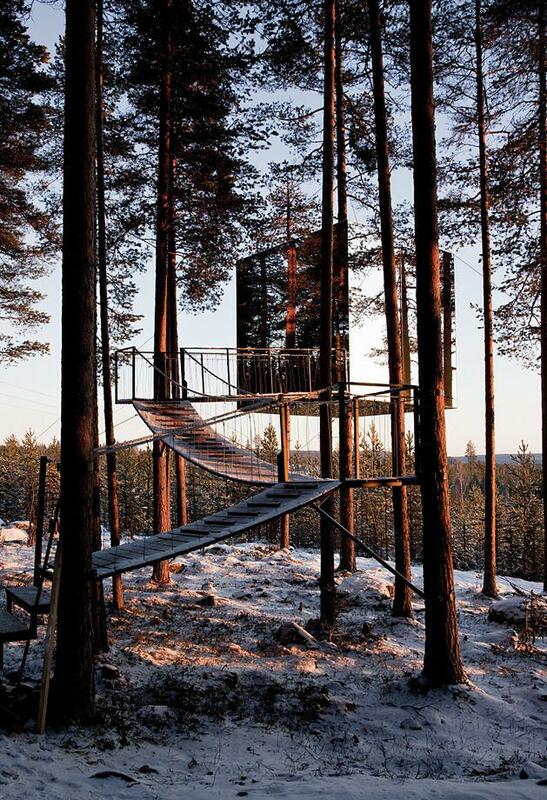 The Cabin at Sweden’s Treehotel has its own deck. Opened in 2010, the Treehotel now has a half dozen treerooms and a free-standing sauna structure, with plans for more. 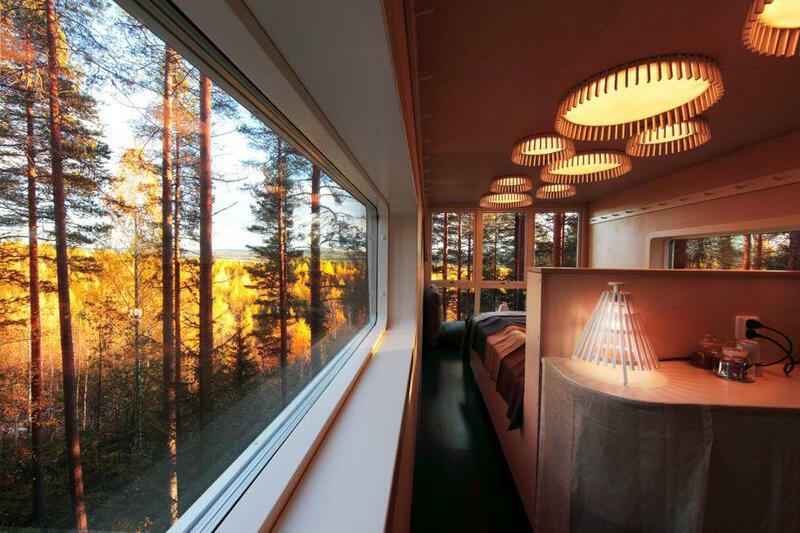 Britta and Kent have given free reign to leading Scandinavian architects to design the eco-conscious, low-impact, free-standing treerooms, which are suspended 13 to 20 feet off the ground, surrounded by miles of forest and views of the nearby Lule River. The treerooms were built on and around live trees; no trees on site were chopped down in the creation of the structures. Each treeroom has chemical-free wood floors with hydroelectric underfloor heating. In lieu of sewage systems, rooms are equipped with odorless electric-powered combustion toilets that incinerate waste at 1112 F. Bathrooms are equipped with sinks that supply running water, but showers are located in a separate building. Meals are served in the hostel, a five-minute walk away, or can be delivered to your perch.